by whatever means it takes. Donald Trump won the presidential election contest because he convinced blue-collar white voters that he would do something about their declining economic prospects. But can he actually deliver for them? Yesterday’s New York Times has an excellent analysis of this problem by the economic journalist, Eduardo Porter, “Where were Trump’s votes? 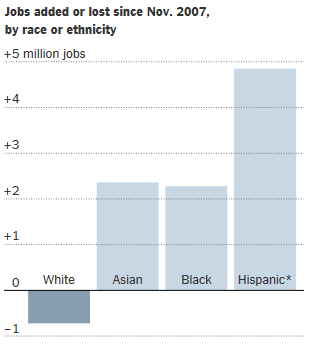 Where the jobs weren’t.” Mr. Porter points out that, in fact, Hispanic, Black and Asian workers have all done much better than white workers since November 2007 (see above chart). 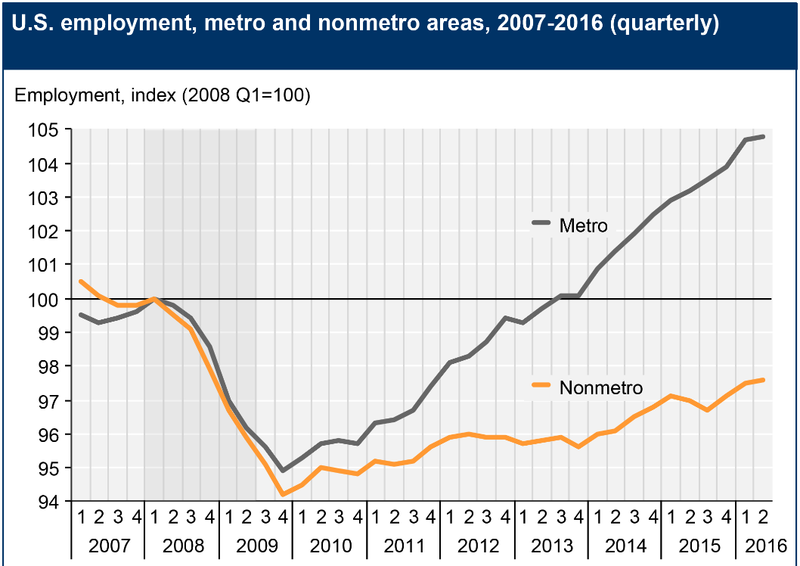 He also points out that all three of these minority groups live primarily in metropolitan areas where jobs have been growing much faster than in nonmetropolitan areas (see above chart). He further points out that while the number of manufacturing jobs has been flat since 1978, the number of service jobs has been increasing rapidly and that most of these new service jobs are in the cities where minorities are clustered (see below). The question then is what Mr. Trump (or anyone else!) can do to help his largely rural blue-collar constituency? Mr. Porter recognizes that faster economic growth will have to come from investments in technology and human capital. But he thinks that this will happen mostly in the cities and thus help minorities proportionally more than whites. Conclusion. Helping blue-collar whites is Mr. Trump’s fundamental economic problem. Faster overall economic growth will help to some extent. Trade restrictions will not help. Immigration restrictions might help but could also hurt the overall economy if employers can’t hire enough workers. Better education and vocational training will help in the long run but not immediately. This is a very tough problem to solve! 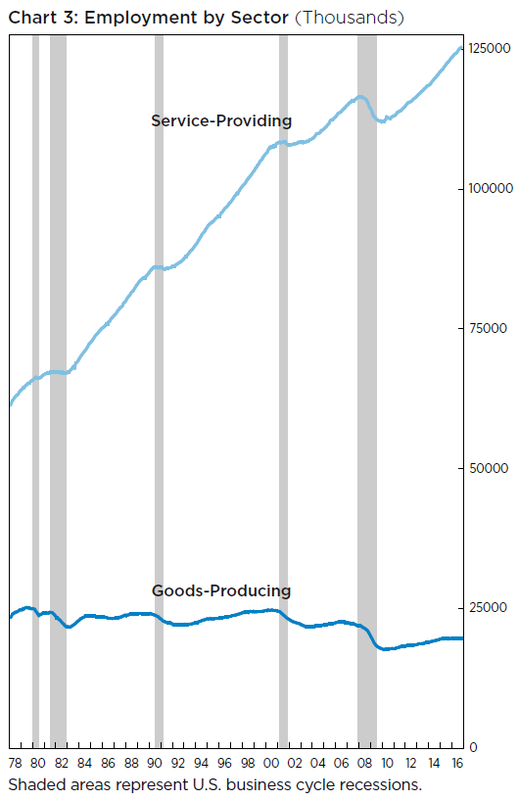 This entry was posted in blue collar whites, Donald Trump, economic growth, Eduardo Porter, Jack Heidel, New York Times and tagged blue collar whites, Donald Trump, economic growth, jack heidel, manufacturing, metropolitan, nonmetropolitan, service-profiding by jackheidel. Bookmark the permalink.